When I came on with Aspiration in January, it was clear in my soul why the joining up made sense. But not many folk in the disaster and humanitarian response circles I run in pay much attention to the overlap of activism and response. It took some time to make it clear and explicit. Back in May Anne from Hirondelle asked for a vizthink for a talk she was going to give, and for the staff working on the project to have a common view of all the moving parts of the program. Anne works in the overlap of response and journalistic integrity1, and has far more experience in both DOING and in EXPLAINING this overlap. I hope that by showing you our drawing and by talking about her case study this overlap can become more clear to even more people. Hirondelle works in radio programming in austere areas. Radio programming can be for music. It can also be to get information out – information about health, politics, and community action. Radio can be used to propagate messages inspiring violence through rumors or outright instigation. Messages can also be used to disseminate messages of truth, care, and empowerment. Radio broadcasts were used to coordinate after the Haitian earthquake. It's a consistent medium used in a lot of places to a lot of different purposes. Communication gets more expensive the further away from a radio tower you are, as outreach has to happen about the radio programs even existing and/or install additional towers. Anne also pointed out that “it’s not just a question of expense. If you’re out of range, you’re out of range. Radio silence." Enter Bluetooth. The consistently increasing number of people with phones, including the Nokia 1100 and other ‘dumb' phones have started exchanging media files via Bluetooth. Even when there isn't any internet, it's still possible to transfer files directly from one device to another2. But people can only transfer what they've already got. And so Hirondelle works with a local women-run NGO Media Matters for Women to set up places called Listening Centers, where media programming is delivered by bicycle. People socialize, listen to a program together, and take the audio files with them to share with others3. Mostly, these Bluetooth ‘podcasts’ are about maternal health, domestic violence, and education4. Hirondelle’s ongoing dedication to development and humanitarian response ("slow" disasters) means they're trusted in most of the communities they're in. Which means when conflict hits, they often continue to be trusted. 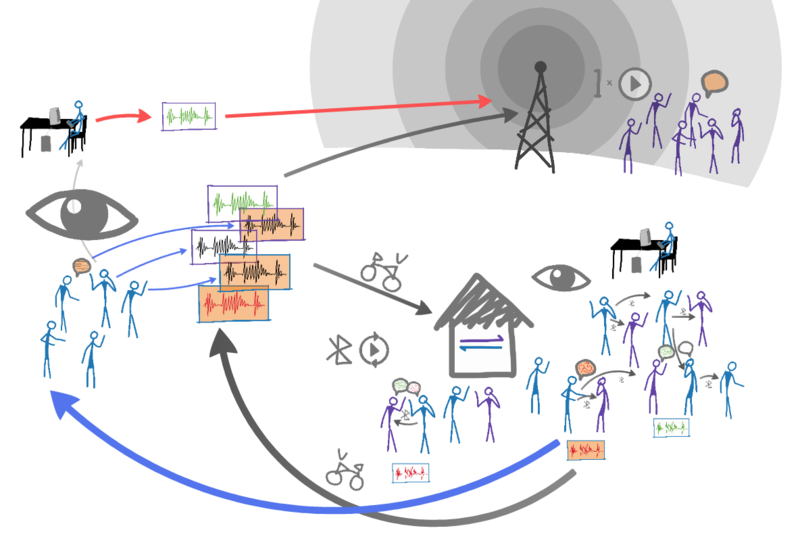 Trust is more complicated for other groups, as organizations like the UN might also set up a radio tower and offer programming during extreme times, but their transient nature, close alignment with ‘official’ voices, and not being in the local language inhibit the deep bonds associated with trust from forming. Local radio stations which are in the local language often end up aligned with (or coerced by) those instigating violence. Hirondelle being independent while still close to the communities they serve, with newsrooms that reflect the diversity on the other side of the microphone, means the trust in groups like Hirondelle is deeper. That's vital for effective response5. This long term investment in community also means that when something as terrifying as Ebola breaks out, there are infrastructural ways6 to distribute trusted messages. The female journalists in their network used the same capacities built up for their physical and digital safety when speaking truth to power for making informed choices during the Ebola outbreak. The skills to think critically about messaging, how to check in with community members, and how to disseminate trusted knowledge outward to others also applied in both contexts. Even the messaging and response to Ebola is politicized, with who people go to for help depending on networks of trust. And in places like Guinea, Liberia and Sierra Leone with long histories of civil war and authoritarian governments, official messages about how to deal with the spread of the disease weren’t trusted – even if the information they contained was right. Our means must match our purposes, and vice versa, and the capacities we build in calmer times bolster our resilience when the world gets complex and dangerous. By taking care of our present selves, our future selves are better off. Which has become activist, strangely/sadly, as truth-telling becomes a radical act. The ability to transfer files to each other directly – something inhibited on many devices through firmware. Copyright (or Copyleft) activism is vital to our ability to create media which is our own / held in common, so we might share it outwards. Can you imagine “oh, this program might help you teach your abusive partner that what they're doing isn't ok, but you can't share it to your sister who might be experiencing the same thing because DRM." Yuck. Being trusted by those wishing to disentangle or opt out of conflict has to do with also having a history of truth telling, especially to power. Activists do this. So do efforts like Hirondelle. Ergo, Hirondelle is activist in a very subtle way. Mesh networks can't be disaster-only, because people won't trust them and won't know how to use them. Means of production. People are not just consumers of media or of technology... to co-create is an act of empowerment which more closely strikes at the root of societal issues.